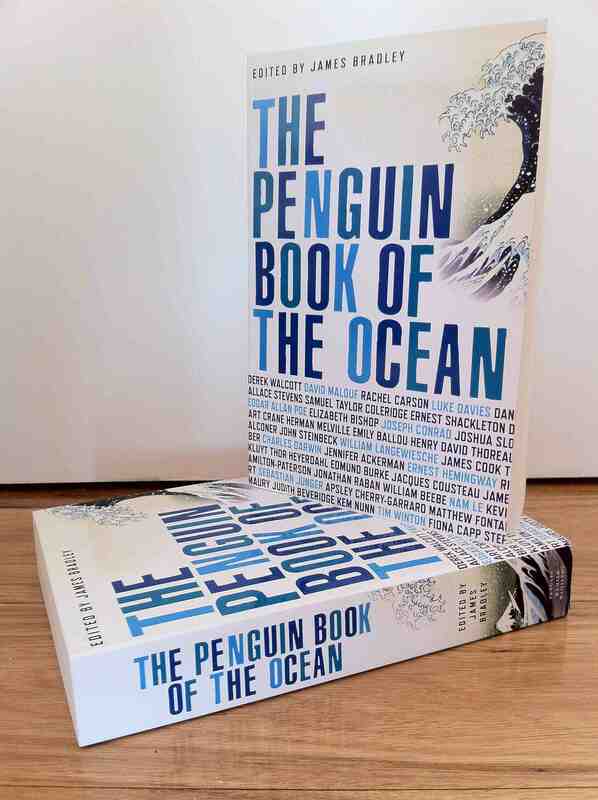 I’ve just received my first copies of The Penguin Book of the Ocean. Holding a book you’ve worked on for the first time is one of those feelings that never gets old, but it’s also one of those moments when you’re painfully aware just how many people it takes to bring a book into the world. So rather than just gloat, or stand stroking the incredibly gorgeous cover, I’d like to say a few thank yous. First up, I’d like to thank everyone at Penguin, especially my publisher, Ben Ball, for trusting me enough to commission the thing in the first place, and my editor, Cate Blake, who had the unenviable task of transforming a small mountain of photocopies and typed notes into an actual book. I’d also like to thank everyone whose work is included for their generosity. Thank you also to the friends, colleagues and commenters on this site who contributed ideas and suggestions; your input was hugely helpful. And finally thank you to the designer, Tony Palmer, for creating what is flat-out one of the most beautiful covers I’ve ever seen. My crappy photo really doesn’t do it justice, so let me just say that if Tony doesn’t win a Design Award for it next year there’s no justice in this world. The official release date is 25 October. I’m excited. Looks fantastic and the contributor list is tantaslising. It’s on my Xmas wish list. Congratulations, James. It’s a beautiful looking book. I’ll keep an eye out for it! Ta all – I’m very pleased (in a nervous, stressed-out pre-publication kind of way). Hadn’t seen the Murdoch before, but have now, and though they’re similar I’m not sure it’s fair to call it a direct take: really it’s just the same image (which is hardly unknown or out of left field, fabulous as it is). But the similarity is interesting, because I understand one of the problems Penguin were grappling with was how to avoid doing a boring cover with a photo of waves or water, and so they decided to go for the graphic approach with funky lettering and a picture rather than a photo, and I do wonder whether whoever designed the Chatto cover was grappling with the same problem: great subject but difficult to make graphically surprising. ps If anyone wants to see the Chatto cover you can check it out at http://widmerpoolscoat.wordpress.com/2009/03/01/off-brand-the-sea-the-sea-1978/ (nothing like a Powell reference in your website title!). And thanks for saying you’re looking forward to the new novel – I’ve been having one of those weeks where it seems to keep getting further away rather than closer, so it’s nice to know someone will be interested when the damn thing is done. James, thanks for your comments. I feel encouraged to write to you more broadly. I am such a fan of your work and your style of writing. The Deep Field blew me away – I read it a long time ago but for some reason the scene that has stayed in my mind was a party late in the book and how you quite insidiously introduced the character Tara and carried us along with Anna when she thought Tara was with Roland and her later confusion and realisation. I don’t know why this scene in particular – but I remember thinking how well crafted it was – and it strengthened my emotional commitment to the character. I wonder if you remember writing this scene in among the whole book. I think it was sometime after that that you did “a what book I would like for Christmas” in I think The Age newspaper – and you mentioned Ursula Le Guin’s ‘The Other Wind’. I hadn’t heard of her at that time and thought if it was good enough for you I would try it. That led me on to this fabulous author and her earlier books which gave me such pleasure. Thank you so much – it means a great deal to me to hear someone say something like that, especially at the moment, when I’m struggling to get this new one done. And I’m not sure I remember precisely the scene you mean (it’s been a while now!) but Roland was a character I was always very fond of, which I think came through on the page. And I’m thrilled it was me that led you to Le Guin; she’s one of my favourite writers. As for the Banks, I love the first few Culture books but I swore off them after I didn’t finish the last one, which was the second in a row I hadn’t finished. Whether I can hold out when Surface Detail comes out remains to be seen, but for now, me and Banks are done. And thank you again – I’m just thrilled you took the time to write. Congrats James – what a fresh idea rather than the usual lists and ideas and a magical and unexpected grouping of authors -cannot wait, shall be buying it the weekend it comes out and read it next to the sound of ocean waves. Very happy for you. And having only just been introduced to Le Guin in recent years lovely to see you share the love. Wow looks great and the contributor list is enticing. Nice work brother James, looks amazing and can’t wait to get my teeth into it. Congratulations, I can scarcely imagine the work that has gone into making this happen.